Okay, now everytime we sit on this couch it needs to be in this specific sitting order. 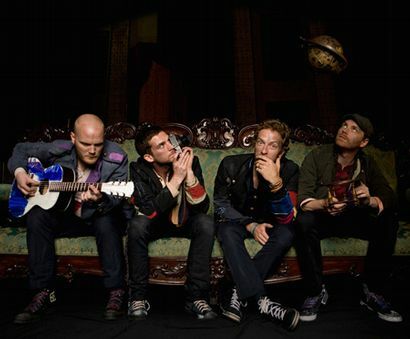 Coldplay fans will probably have to wait until the end of this calendar year for the release of the band’s fifth studio album that lead vocalist Chris Martin says may begin with an M and be two words. May I suggest More Manic. In an interview with BBC Radio 1 DJ Zane Lowe, Martin said that the album will explore “love, addiction, OCD, escape and working for someone you don’t like.” Yeah! Fight the establishment. Martin also described how the album will be representative of “what happens within the group.” Anyone smell volatile group relations. It would seem that this interview subtly portrayed portentous happenings. Well, if my ramblings are true, I’m sure Jay-Z wouldn’t mind forming a group with Chris Martin. Recently he said that Martin was a “‘a brother from another mother” and lauded him as a true musical genius. Well, I don’t know if I would go that far. It will be difficult to eclipse the success of Coldplay’s last release, Viva La Vida or Death and All His Friends. But, Coldplay has a large following and anything is possible. Tribute bands often attempt to clone the look of their heroes in an attempt to be more authentic. Somehow echoing the band’s sound is not enough. But, Pyromania, a Dallas-based Def Leppard tribute band, may be taking their search a little too far. 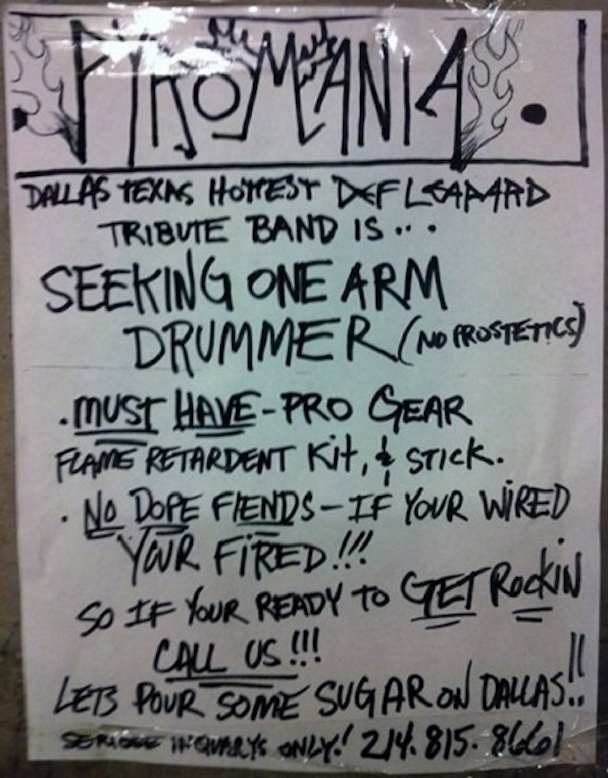 In a flyer (above), the band wrote they are looking for a “one arm drummer (no prostetics).” I presume this statement means they are looking for a drummer with one arm who does not wear a prosthetic replacement. You would think that someone in the band would have done a quick spell check before posting the flyer. Come on guys. Def Leppard is of course famous for their drummer Rick Allen who overcame the complete amputation of his left arm at 21 years old. Even without his left arm (which he lost because of a car accident) he is still able to pour some sugar on anyone. Pyromania also requires the drummer to have a “flame retardent kit & stick.” Pyromania, the correctly spelling of retardant is retardant. And, remember folks, “seriose inquarys only!” So, if you lack an arm and an ability to spell correctly, Pyromania is looking for you. Actually, scratch that, let me add to the flyer that the drummer needs to also be semi-literate. Yes, someone who can spell to write future flyers. Steven Tyler, who is currently a judge for “American Idol,” wants to get Aerosmith together for a new album but he cannot find guitarist Joe Perry. Joe Perry does not like Steven Tyler. The two barely talk off stage and Perry has made it clear that he thinks “American Idol” is absolute garbage and he would be ashamed if Aerosmith was linked to the show at all. No problem, thanks for the view and comment!